As Twitter and Medium modernize for the new age known as the third quarter of 2015, they’ve both made announcements about the astonishing new directions the companies are taking. Both will be letting users have access to something extraordinary and magically powerful. I’m impressed. 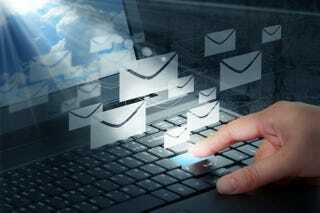 Sending email through Twitter is major breakthrough. My AOL account is getting jealous. We’re very excited to announce the launch of a new feature for Publications. We’re calling it Letters. We think it’s valuable, especially in today’s world of endless information streams, to remember the act of letter writing as an intimate form of communication. So what is a Letter? It’s a way of connecting with your publication’s followers and starting a conversation. It’s delivered to the inboxes of all the people who follow your publication. Wait, wait, wait ... hold on. You mean I can use Medium to send a letter? Digitally? To ALL THE PEOPLE? So ... it’s email. Sorry, no, it’s bigger than that. It’s a listserv. I love the future.